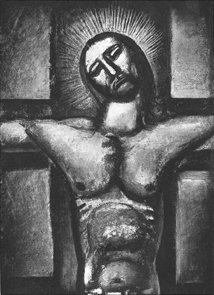 Rouault’s art makes it clear that the cross cannot be abstracted from the One hanging on it. Here, Goizueta gestures to the misappropriation of symbols for the sake of power. I strongly sympathize with this claim. If this is the case, however, can we employ religious imagery in public or political contexts in ways that do not distort the meanings of the images or unjustly manipulate Christian believers? If so, how ought we treat such images? Certainly, there are examples of ways in which images have empowered religious people to work for justice (the United Farm Workers marching under the banner of the Virgin of Guadalupe). Still, there are multitudinous examples of the ways in which Christian religious symbols have been used to dominate and exploit. I am perplexed.